Sparrow Pipe Tobacco uses a gentle aging ribbon cut premium high quality tobacco with just the right touch of Cavendish for the filler, making them deliver a superb smooth smoke every time. Each of the Sparrow Pipe Tobacco blends listed below at our online pipe tobacco shop is packaged in a neatly resealable stand-up pouch keeping the premium tobacco inside fresher and lasting longer. 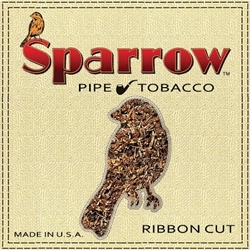 Sparrow Pipe Tobacco has a flavor that is unique unto itself and it is offered at a value that’s worth trying. Sparrow Pipe Tobacco is American-made distributed nationwide North Carolina Tobacco Manufacturing, LLC Stantonsburg, NC USA. Each pouch of Sparrow Pipe Tobacco are available at our online tobacco store in Blend No. 23 Green (Menthol), Original Blend and Smooth Blend. Each day smokers are trading in their expensive retail brands and choosing Sparrow for their tobacco smokes. An ideal way to save money in an over-priced world. Here at Smokers Discounts we believe you should too! We’ve made it easy and affordable to buy Sparrow Pipe Tobacco online. Call us for more details!